Recipe from Margaret Asselin-Wood, Director of Marketing, Masterfoods USA (Dove Chocolate). Recipe featured by Holly Clegg, author of Too Hot in the Kitchen: Secrets To Sizzle At Any Age. 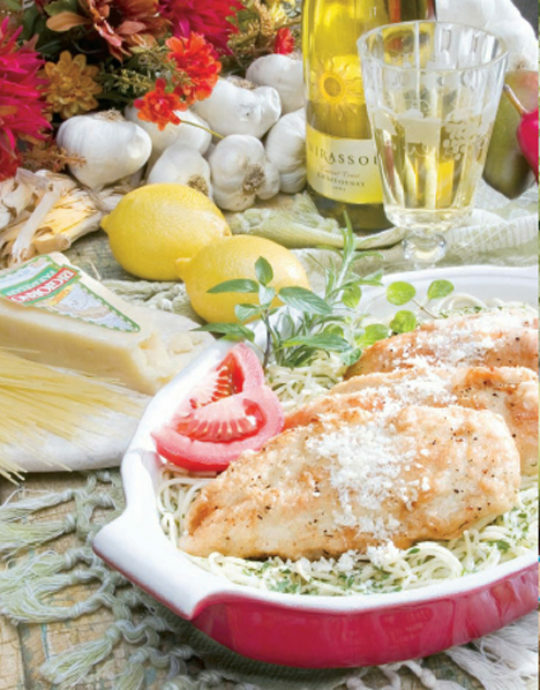 Dean Martin would have sung a different tune to “That's Amore” had he tried Sylvia’s Chicken Scallopine first! Make this meal for your guests, and they’ll know you prepared it with love. With a meat mallet, pound chicken breasts to 1/2-inch thick. In a small bowl, combine flour and cheese. Dredge both sides of chicken breast in flour mixture. In a large sauté pan, sauté chicken breasts in 1 teaspoon olive oil for 3-5 minutes on each side or until cooked through. Remove from pan. Heat butter and remaining olive oil together over medium-low heat. Add garlic and cook 1 minute. Add wine and simmer for about 3 minutes or until wine is evaporated. Add remaining ingredients except salt, pepper and parsley. Simmer sauce for 5 more minutes. Add salt and pepper. Serve each chicken breast with 2 tablespoons sauce and 1/2 cup cooked angel hair pasta and parsley.